A leader and one of the most respected online marketers shared an update on his Facebook timeline saying that ads Click Through Rate (CTR) are not as important as most people want you to believe. If you’re one of his loyal followers like myself, you might feel a great relief reading what a leader in the industry has to say about how ctr affects ads performance. The person in question is someone i have learnt so much from and i like to comment on his updates. As a pay per click advertising enthusiasts and someone with years of experience in search engine marketing, i quickly commented on the post sharing some facts with him and for everyone reading his post. 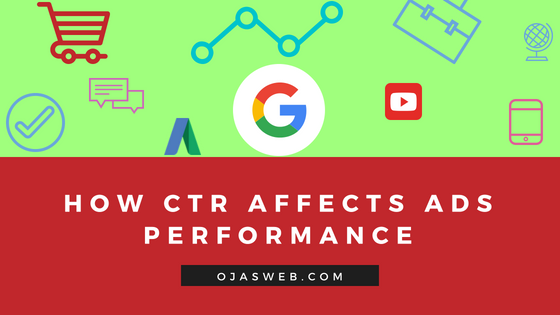 After conducting thorough research, and combining the data with my years of practical experiences in search engine marketing, i have been able to identify at least five ways by which CTR affects ads performance. I’m so happy this is not an argument, it is a fact that can be proven with data. I hope someone will learn from this post and possibly use the idea to enhance the performance of his search ads. Let’s dive straight in. The image above shows the conversation between a client and myself. The conversation was just few days before the Facebook update i mentioned in the beginning of this post. I wanted to explain the parts i squared, and i’m pretty sure you’ll find this very interesting and informative. Did he just shoot himself in the feet? You’ll find out in the next few paragraphs. Many people say they never thought that Click Through Rate (CTR) has any effect in ads performance, however that is not true. If it doesn’t, Google will probably not have included it in the default metrics in all their major tools. Now that you’re here, you will have better understanding of it’s effect. There are three components of quality score, and one of them is directly affected by the ad click through rate (CTR). The screenshot above is from my client’s account. What i am interested in showing you is the effect of CTR on quality score. As you can see in the image, the particular keyword has CTR of 13.99% and in the components of quality score, the “Expected Clickthrough Rate” is “Above average” and the overall quality score is 9 out of 10. The average position of the keyword is 1.2, which means that the keyword is serving ads mostly in page 1 of the Google search result pages, and the ad is usually appearing between position 1 and 2. This is really a good performance and that’s what ever advertiser wants for their ads. Assuming the expected CTR is below average, the performance would have been lower. Everyone knows that the lower the quality score of a keyword, the more expensive it becomes to serve ads with it. This has been explained by Google and i’m here to show you a proof. I captured the image above from the new account i just acquired. Undoubtedly, some keywords are very expensive, however it can even cost more if the quality score is really poor. 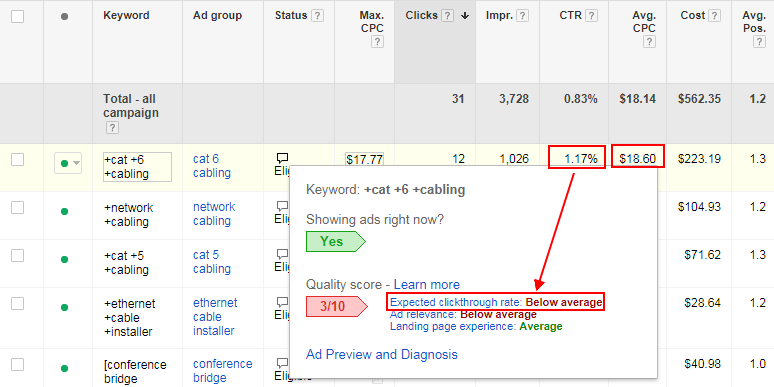 In the image, i highlighted the CTR, Expected Clickthrough Rate and the average cost per click. The CTR of the keyword is 1.17% and the expected clickthrough rate is below average. The expected CTR shows that the ads should have been clicked more times. Now back to my conversation with a client, if the ads are being served outside your target location and not being clicked, the click through rate will reduce and this will directly affect the “expected clickthrough rate” as seen in the image above. You may ask what is the reason for low CTR? There are many possible reasons, however as seen in the screenshot, the ad relevance is also below average, which means that the ad text might not be very relevant to the target keyword, making users to avoid clicking. 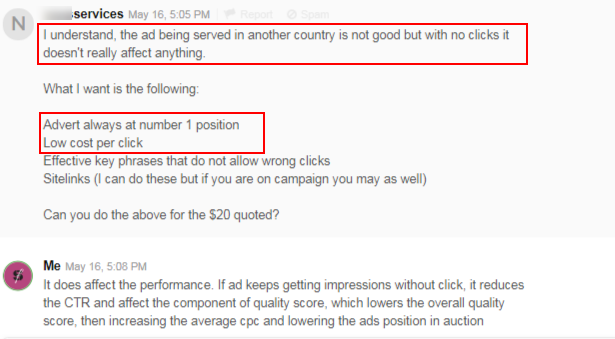 The major effect of this as seen in the screenshot is higher cost per click (CPC). The average CPC is $18.60, however if the quality score is higher, say 8 and above, the average CPC might be as low as $14. So you have seen the how ctr can affect the average cost per click of an ad. This is the most complex part of it, but unfortunately i do not have a good image to explain it. Basically, auction is how the Google system determine which ads to show to users at any particular time. According to Google, the auction system takes into consideration several factors, including the bid, auction-time ad quality, the Ad Rank thresholds, the context of the search, and the impact of ad extensions. The interesting thing about the auction system is that advertisers can pay less and still appear in the top position if their ads quality are great. They have a really good explanation on their support page and you can read it via this link. Obviously, Google use several factors to determine the average position of an ad and one of them is the click through rate. As seen in the Google help page, there are many signals that can contribute to the quality of an ad. A single factor such as ad relevance can result in low CTR, and poor average position. Sadly, if the if the CTR is low, it will also affect the expected clickthrough rate. When two of the components of quality score are below average, the quality score will be very low and this will greatly affect the auction. No doubt, the average CPC will increase and the ads will mostly appear in lower position. In the long run, this will affect the overall performance of the ads negatively. To learn more about the complex process, kindly visit this page. No doubt, anything that affect the performance of your ads will definitely make the advertising more expensive. For instance, if your keyword quality score is 2, and the average position of the ad is 1.5, definitely you’ll be paying higher cost per click than when your keyword quality score is 8 or more. I’ve read several blog posts on how to increase ads CTR on top blogs like wordstream and search engine land. I have not published any post on that topic, however i will share some tips here so that you can easily implement it on your ads and start seeing good results. Focus on creating top quality ads: the majority of issues affecting the performance of your AdWords campaign can be related to the quality of the ad. If your ad creative is poorly written, it will affect the ad relevance. The ad relevance will possibly affect the CTR and the CTR will in turn affect the expected click through rate. The cyclic event will eventually reduce your keyword quality score which will affect the performance of your ad. So, to avoid all of these, make sure you dedicate time to write top quality ads. Be very selective with keywords: I have seen several accounts with no structure. 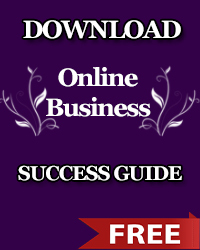 Hundreds of keywords in a single ad group. This is pretty common, and it is one of the major things that affect the ad quality. When there are way too many keywords, it becomes very difficult to write tailored ad for all of them. Google recommend 10 to 20 keywords per ad group. If possible, you can even make it maximum of 10 keywords per ad group. When you have fewer keywords in your ad group, you can easily tailor your ads around those keywords. Create up to 3 ads per ad group: If your ad group has maximum 10 keywords in it, having 3 well-written, tailored ads will help improve the ad relevance and increase the click through rate. Keyword match type: Several people target broad match keywords in their campaign, yet they are not using any negative keyword to block irrelevant traffic. This is mostly neglected, however it plays great role in the account performance. If you’re targeting broad match keyword, make sure you add plenty negative keywords to block irrelevant traffic. I hope you’ve learnt one or two things in this post. We can make it more educating if you post your questions in the comment section or share the post with your friends so that they too can learn from it. I’m available to help you review your account or manage it so that you can profit from your search engine campaign. Visit this page to send your request. Thanks again for reading.